Soufflés are like lovely, fluffy treats that are wonderful by themselves or as a side dish. There are also some amazing dessert soufflés out there. By definition, soufflés get their delicate texture from egg whites that have been whipped to a shiny, stiff peak. 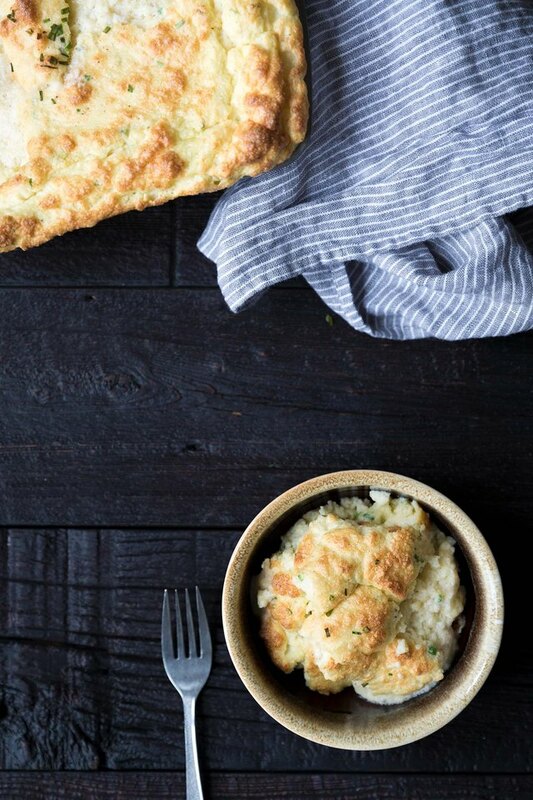 While they can be slightly intimidating at first, knowing how to make a soufflé is a wonderful skill to have, and this version is sure to impress guests! The ingredients in this soufflé are fairly straight forward. You can use either pre-grated or freshly grated cheese, but freshly grated tastes best (as always). Feel free to experiment with adding other fresh herbs and spices. The one optional tool recommendation is a potato ricer, which I love using for mashed potatoes. 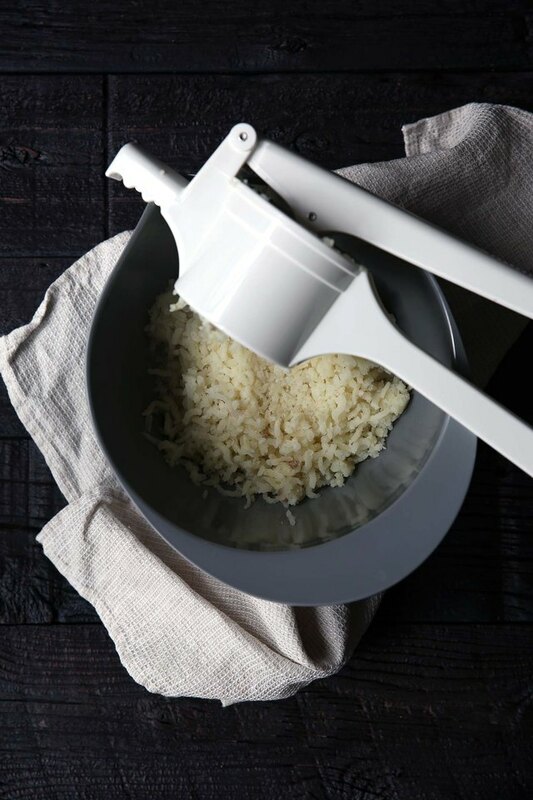 A potato ricer peels and mashes the potatoes all at once, making it a real time saver. However, a regular vegetable peeler will get the job done. Preheat the oven to 375 degrees Fahrenheit. Grease an 8 x 8 baking pan or similarly sized dish with butter or baking spray. 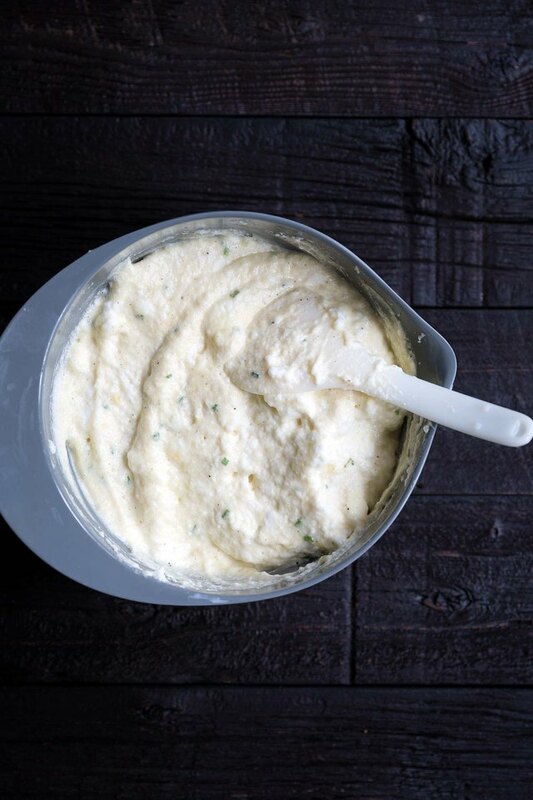 There's no wrong way to cook, peel and mash the potatoes for this recipe, if you have a preference. My method is to slice the potatoes into thirds without peeling, place in a large pot, cover with cold water, and bring to a boil. Cook until tender (approximately 15 minutes), then drain and mash into a large bowl with the potato ricer. 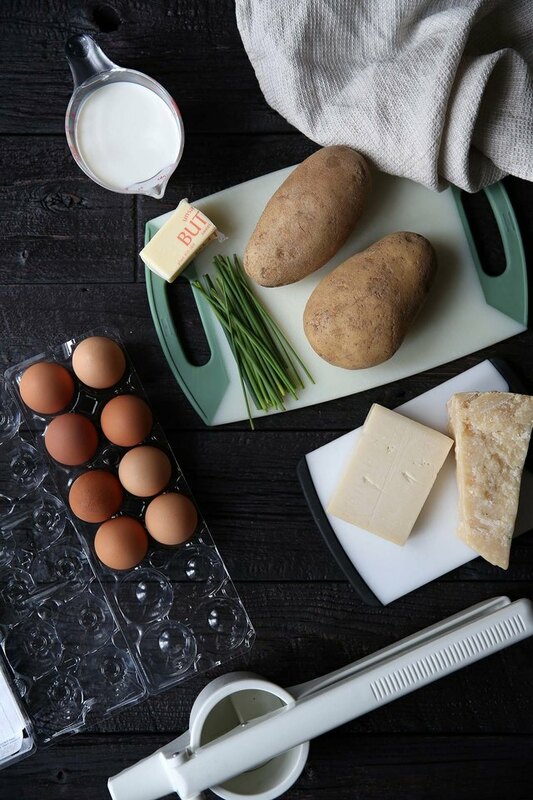 While the potatoes are still very warm, stir in the butter, cheeses, yolks, salt, pepper, and chives. Once the mixture is smooth, stir in the half-and-half until evenly combined. 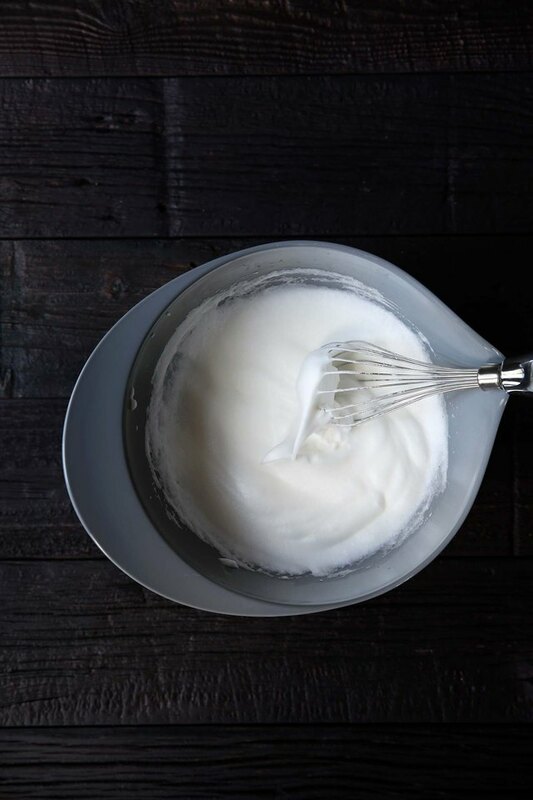 In a large bowl, whisk the egg whites using an electric mixer fitted with the whisk attachment (or by hand). Start on a lower speed and gradually work up to a high whisking speed until a glossy, stiff peak is reached. Add approximately 1/3 of the egg whites into the potato mixture, stirring until combined. Gently fold in the remaining egg whites, taking care not to deflate them. It's OK if there are small patches of egg whites that aren't completely mixed into the potatoes. 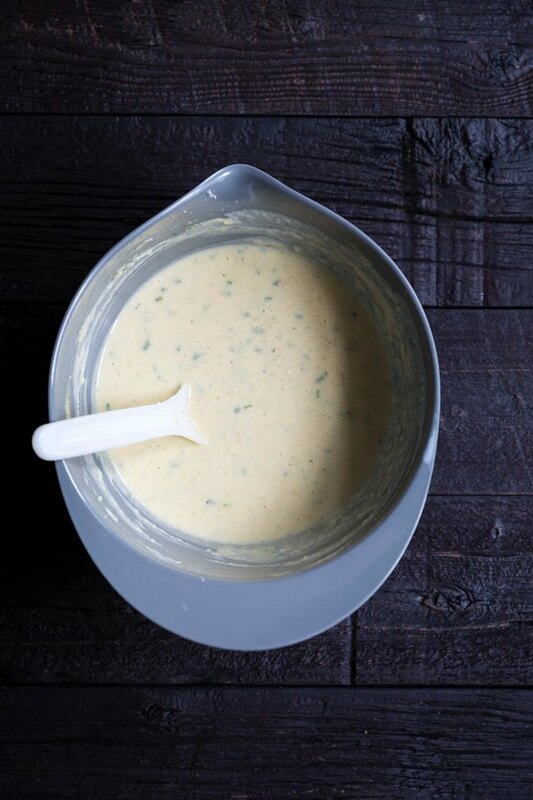 Pour the mixture into the prepared pan and gently smooth out the top with a spatula. Bake until the souffle is puffed up, golden brown on top, and only barely jiggles in the middle, 30 to 35 minutes. Optionally, before removing from the oven, you can turn on the broiler for 30 to 60 seconds to enhance the browning on top.